Mrs Brown bent down. “You’re a very small bear,” she said. “I’m a very rare sort of bear,” he replied importantly. “There aren’t many of us left where I come from.” “And where is that?” asked Mrs Brown. “Darkest Peru." Michael Bond based Paddington Bear on a lonely teddy bear he noticed on a shelf in a London store on Christmas Eve 1956, which he bought as a present for his wife. The bear inspired Bond to write a story; A Bear Called Paddington - first published on 13 October 1958 . Little could he have known then how many people from around the world would come to know, love and adore his small bear from darkest Peru. Today, the adventures of Paddington Bear continue to captivate both young and old around the world. His huge popularity has recently propelled him on to the big screen making Paddington a famous film star now! Not only that …. He has BAFTA nominations! 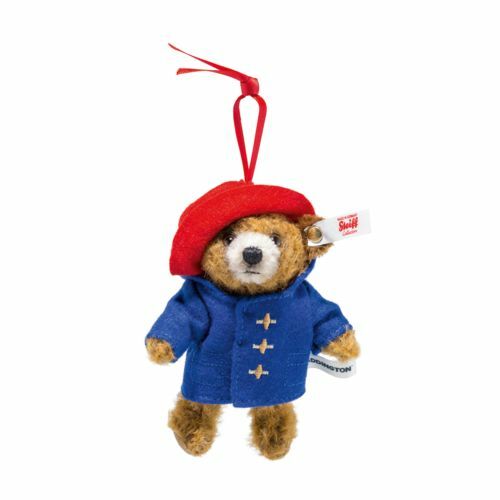 This deliciously scrumptious teenie Paddington is only 11cm tall, but ginormous in character. With a red ribbon attached he can become your constant companion wherever you may be. He can even decorate your Christmas tree. He is exclusive to the UK and USA and is made in a limited edition of 4,000 pieces. He follows extremely proudly behind the hugely successful paw prints of his big brothers from the previous years. Illustrated Movie Style Guide PADDINGTON™ and PADDINGTON BEAR™ © Paddington and Company Limited/Studiocanal S.A. 2018 Paddington Bear™, Paddington™ and PB™ are trademarks of Paddington and Company Limited Licensed on behalf of Studiocanal S.A.